Learn how to use Android apps without actually installing them on your mobile phone. With Instant Apps feature you can find and use a cloud-based preview of the currently supported apps. You just got to know that the app that you have been waiting for is finally available. Very enthusiastically you click the link that has been emailed to you. The app’s website opens but, phew!, you cannot preview the app unless you install it on your mobile device. So, you decide to check it out later. However, with Android Instant Apps, this situation could be eliminated for very many apps. 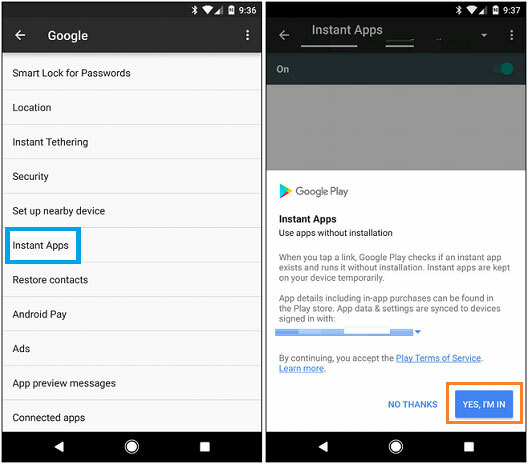 Android Instant Apps allows you to access the cloud-based version of an app without accessing the Play Store to install it manually. Therefore, you can use an app beforehand instead of installing it and then try it out. It is more like walking through a short app demo, but at the same time, you can use it like any other app on your phone! 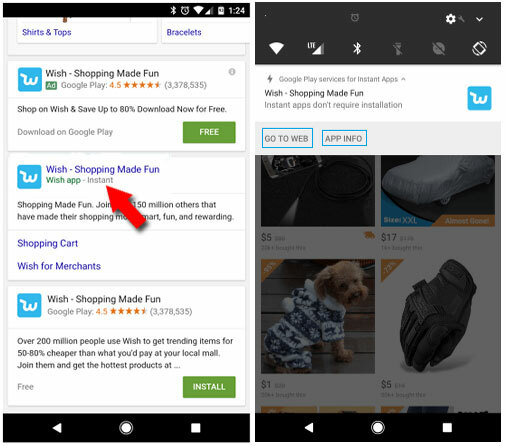 With Instant Apps enabled on your device, if you click a link that is associated with an instant app, it will automatically launch a short version of the app. Instant App works with Android 6.0 and above; however, this feature is not supported on all devices. For example, it does not support Samsung Galaxy J5, S8 but works on Nexus 6P and Pixel. Go to the Settings menu on your phone, scroll down and tap on Google. Under the Services section, select Instant Apps and enable it by toggling the switch to ON. If you do not see the option, it is because your device does not support it. In the subsequent screen click on the Yes, I’m in button. The Instant App feature is now active on your device; let us see how to use it efficiently. Currently very few apps support Instant Apps. Some of the apps that support this feature are: Wish, Viki, Buzzfeed, and Periscope. Going forward, Google may expand the experience to more apps and users. Wish and Viki are the simplest and easiest to install and use, however, I could install Wish after two attempts and failed to install Viki. Launch Google Chrome on your mobile phone and search for Wish. In the search result, look for the app name that has ‘Instant‘ attached to it as displayed in the illustration below. Tap on this result. It takes a few minutes to download the required elements before launching the cloud-based version of the app. You can use Instant Apps as you use any other app on your phone. The Go to Web link redirects you the app’s website and App Info link displays the app’s information including how to install the full app and how to clear the app data. Open the Settings menu on your Android phone and tap on Google. Under the Services section, choose Instant Apps. The list of apps will be displayed. Tap on the app name and then tap on Clear App Data. As and when Instant App reaches all the devices, it will eliminate the pain of installing the apps on our phones, especially those apps that we do not use on a regular basis.